So the "Based on True Incidents" mainstream genre appears like it is here to stay. We aren't talking about biopics - we have too many of those, often poorly made - or Ram Gopal Verma's gory sensationalist assignments, or even the offbeat films which, while being well-made, are not necessarily embraced by the larger public (Talwar, for instance, wasn't watched all that much despite rave reviews). We are talking about a different kind of film which sources its material from a true incident, dramatises it with fine skill (maybe with some salt and pepper thrown in), and, importantly, somehow manages to make itself accessible to the mainstream audience. We're talking about the likes of Special 26. We could have called that a flash in the pan or a single director's special accomplishment. But then we had Airlift which wasn't directed by Neeraj Pandey but by Raja Krishna Menon. And now, Ram Madhvani (with a competent script from Saiwyn Quadras) pulls off Neerja with aplomb. Three films by three different directors does look like a confirmation. The true incident in Neerja occurred in Karachi in 1986 where a New York-bound Pan Am flight was hijacked by Palestinian terrorists who wanted to divert the plane to Cyprus. 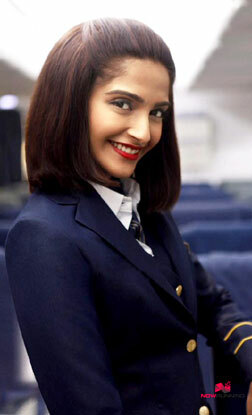 Head Purser Neerja Bhanot (Sonam Kapoor) - don't forget to read up about her after watching the movie - shows tremendous presence of mind and becomes instrumental in foiling the hijack and saving many lives. There are many things to discuss about the film - the superb direction which authentically establishes the atmosphere (unlike Airlift which fails due to the under-direction of junior artistes), the excellent script which successfully burrows into Neerja's mind giving us a glimpse of how she's happening to be the indomitable spirit she is, the spot-on casting and the pitch-perfect performances by all of the supporting cast (Ali Baldiwala as the terrorist Mansoor is flawless). We tip our hats in acknowledgement of these accomplishments of the film. However, we find it a bit more exciting to direct our attention to a different but fine point of what qualifies as mainstream. How does this variety of based-on-true-incidents films differ from the more offbeat variety of the likes of Parzania? The answer, we believe, is Catharsis. As Neerja was progressing, this reviewer was becoming consciously aware of something being amiss. The craft is commendable - apart from the direction, script, cinematography and score being first-rate, the performance by Sonam Kapoor is practically effortless. Yup, there's no problem with how the film was made. What seemed to be the bother was that this film wasn't trying to whip up strong emotions. Which is fine and even expected in an offbeat film - but in a mainstream film, you promptly hand over your heart expecting it to be played with till you experience a cathartic high. That is what you love about Lagaan, or Vaastav, or Rang De Basanti. The stars help because we trust them more with our sensitive feelings, but what truly matters is you need to feel your heart tugged - whether you are plunged into laughter or you are moved to tears or you are drying your sweaty palms. Special 26 knocks your socks off with the twist at the end, Airlift fills you with both triumph and patriotism, but Neerja..? Neerja didn't seem to be doing anything of that sort. When the film is practically all done, and you've witnessed the tremendous grit of Neerja Bhanot and you're filled with enormous admiration for the woman, you're still feeling all right. Yes, you can see that it is quite a technical achievement and you find some lauding adjectives to describe it, but you aren't necessarily strung with any intense emotion. That's when the film unleashes its most lethal weapon on you - Shabana Azmi. Azmi as Rama Bhanot and Yogendra Tiku as Harish Bhanot, the doting parents of Neerja, are seen throughout the movie skilfully portraying the unspeakable anxiety of not being able to get through to their child who's in extreme jeopardy in a far-off land. However, the epilogue speech by Azmi where she talks of her heroic daughter makes it a different movie altogether. Forget you handing it over, Azmi seizes your heart and wrings it. Neerja stops being a well-made but rather distant film about a hijack and a hero, and transforms into a souvenir you'll hold close to your heart. You now have to look at it from the mother's moist eyes. You'll have to register the indescribable difficulty of never being able to see her child again. But you'll also have to comprehend her steeling up to the responsibility her daughter's sacrifice entails for her - of staying strong and spreading the inspiration. The stoniest of hearts can't stand against the steeliest of resolves. We're of course talking of both the mother and the daughter. When are you going to add the review for Neerja?? Watting for it. fullhyd.com has 700,000+ monthly visits. Tell Hyderabad what you feel about Neerja!